What is culture? Where is it located? What is it for? Where does it come from? Why do cultures persist over time? How do cultures change? The Dream of Culture attempts to unravel a paradox: that human beings strive to keep asleep while priding ourselves on being wide awake. Just as the work of dreaming is to safeguard sleep, much of the work of culture is likewise to keep us from thinking, feeling, and knowing too much during waking hours. Much of culture is not merely like a dream. In culture, ours is the tragic conceit to dream that we are not dreaming, and to make wakefulness the most heinous sin. 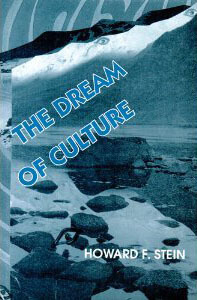 This book explores the hypothesis that culture is our dreaming together while we are wide awake. People in groups, awake, do with their shared symbolic and ritual materials, their technology and their environment, what we each also do while asleep: wish what we may dare, and disguise our wishes; contrive our forbidden victories and stage our defeats; attempt to master what we have found overwhelming. Culture and dreams are part of each other, twin (isomorphic) facets of the same process. In this book, Howard Stein explores the work of culture as if it were a species of dream work. A truly remarkable collection of essays—an enduring contribution. —Prof. John Connor, Dept. of Anthropology, California State University, Sacramento. Howard Stein has one of the finest minds engaged in the study of culture in our time. He has the capacity to see straight through to the meaning of things, and to understand it and express it with precision–a quality people used to refer to as genius. This wide ranging book of essays is a feast. Howard Stein has long been one of the most astute and trenchant observers of the American cultural scene. He persistently draws our attention to the dynamics that drive our actions and compel us to shield ourselves from direct knowledge of what we are up to. Not only an academic scholar, he is a committed activist and public intellectual deeply engaged in the community life around him. For anyone interested in anthropology, psychoanalysis, ethnicity, the family, or medicine, and for everyone who has admired, as I have, the insightful and original thinking of Howard Stein on these (and other) subjects, this volume will be an intellectual treat. One of the most original thinkers in the human sciences of the 20th century. Howard F. Stein is Professor at the University of Oklahoma Health Sciences Center, Department of Family and Preventive Medicine. He is the author of 26 books and over 250 published papers and chapters.